To paraphrase the Bible, He that findeth a Wife, findeth a good thing. Our Pastor, Dr. Lawrence M. Wooten, found a good thing in 1994 when he married Evangelist Missionary Shirley James Wooten. This is the union of two wonderful, spiritual, anointed, teachers of the word. Evangelist Missionary Shirley Wooten was born in Boykins, Virginia, the second oldest of four daughters of Mr. and Mrs. Hugh Adkins. She also was an educator. Graduated from Virginia University in 1972 with a Degree in Education. She was a High School English Teacher for a number of years in Virginia. Sis Wooten worked toward a Masters Degree in Public Relations Communications at Syracuse University in Syracuse, New York. She became a Certified Public Speaker and a Certified Course Developer. Sis. Wooten was a Sales Training Specialist with Carrier Air Condition Company in Syracuse, New York. She was featured in Ebony Magazine and Black Enterprise Magazine as the first Black Woman Sales Training Specialist at Carrier. She was a Writer Producer for Maritz Corporation in Montuale, New Jersey. Sis Wooten was a Course Developer, Instructor, and Internal Auditor for Southwestern Bell Telephone Company. After working for others for many years she became the Founder and Proprietor of Kings Choice Barbeque Restaurant. Sis. Wooten was saved and baptized with the Holy Ghost, February 1979 at Williams Temple COGIC, under the leadership of Dr. Lawrence M. Wooten. She became a licensed Evangelist Missionary in 1986. Most recently in 1998 she has been named a Licenced National Evangelist. 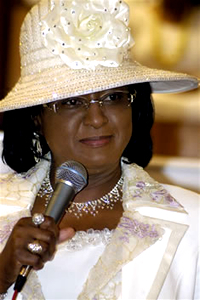 National Evangelist Missionary Shirley Wooten, we at Williams Temple C.O.G.I.C. are proud to call her our First Lady.